1. The battery ram is produced in accordance with the national standards and the recognized safety rules. Nevertheless, its usage may come with some risk. This tool may put life in danger, hurt the limb of the user or the third party, and cause damage to this machine and other objects. 2. This machine must be used on the condition of meeting the technical requirements and following the instructions and its designated use. The operator must have the safety awareness to fully identify the risks involved in the operational procedure. Any functional disorders, especially the safety problems, should be resolved immediately. 3. The battery ram is exclusively designed for the application mentioned in the operation manual. The usage for any other purposes is considered to be contrary to its designated use. The manufacturer and supplier assume no responsibility for the consequences arising therefrom. The operation activities within the application scope of its designated use involve reading the product specification and following the inspection and maintenance instructions. Description The battery ram is lightweight and can provide strong jacking force up to 260KN, which is enough for dealing with vehicles rescue and general relief. 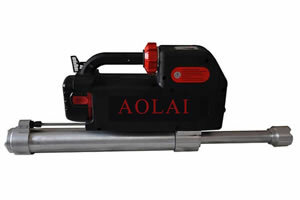 The cylinder is made of high strength and lightweight alloy. The antiskid tooth is elaborately designed to avoid falling off. The bi-directional hydraulic lock and automatic reset valve could keep the operator safe when the unexpected things happen. It takes short time to extend the ejector rob, which accelerates the rescue process. Application: The battery ram is specially applied for the highway or railway accident rescue, air crash relief, beach relief, buildings and disaster relief since it can be used to move obstacles and top objects to create the rescue channels and maintain the object stable.